Yep. Still rusting in dock. Looks ok inside actually, there was some photos in 2011, but it ain't gonna be completed anytime soon. Or ever. What kind of new systems could involve a future modernization of slava class cruisers? Redut SAM could be fitted? Everything could be modernized, if the will is there. No news on radical upgrades to weapons complexes though. However I spotted new laser-range finders and optical aiming systems on the Ak-630 radar and manual-firing installation. You can see both here. Album of Twower's visit to the Varyag. The standard armament for future Russian vessels is UKSK launchers for anti ship, anti sub, and land attack missiles, so UKSK launchers would replace P-1000. Redut is currently the SAM option, though there is a possibility that UKSK could be adapted to SAMs as well. In terms of artillery they have 130mm guns in a stealthy lightened turret called A-192M, or the new 152mm guns being based on the joint Coalition programme. It all depends on how much they want to spend and when they want to do it. Do it now and they could do a cheap and simple upgrade. Wait 5 years and do a more expensive and more thorough upgrade. Personally I think the best solution is to do both a simple and cheap upgrade now with new electronics, and in 5-10 years time apply a more thorough upgrade with new technologies that will be cheaper then. The standard armament for future Russian vessels is UKSK launchers for anti ship, anti sub, and land attack missiles, so UKSK launchers would replace P-1000. Quite true, but the Vulkan is a Russian missile so they might just keep producing them for the remaining Slavas. Of course at the end of the day the Slava had a lot of electronics in her and was intended as the cheap option if the Kirovs failed as a flagship. This suggests a lot of internal space could be freed up simply by removing the old obsolete electronics and extra crew and make a deep upgrade possible. They could just keep the Vulkans as it is an impressive missile, but fitting UKSK should reduce the top weight of the ship and improve performance dramatically. Just replacing the myriad of radars and sensors with a main AESA will simplify and modernise the design dramatically. Of course in a deep modernisation they would need to replace the propulsion with a nuclear unit... there is no point in operating conventional powered Slavas in carrier groups where even the destroyers are nukes. A carrier group moves as far and as fast as its slowest shortest range element, so the point of going nuke is to increase speed and make range unlimited. GarryB wrote: Quite true, but the Vulkan is a Russian missile so they might just keep producing them for the remaining Slavas. Is it worthy such a radical and costly modernization for 3 ships? The thing is that they are working hard on Destroyers right now and they likely wont complete that design till this year or next year let alone lay down a hull and start serial production. A new, from scratch design needs to be built and tested thoroughly before you can start cranking them out in the numbers you need. They need lots of Corvettes, several dozen Frigates, and 20-30 destroyers pretty soon to replace retiring and obsolete vessels. What with carriers and of course all the support ships and infrastructure needed to operate them I doubt they will be building cruisers till after 2025, and they will have Mistral class carriers in 5 years or less that will need large ships to support its operations. The short term solution is a minor upgrade of Kirov and Slava class vessels. Nothing radical, but get rid of stuff you can't support like Granit from the Kirovs and give them an electronics suite that will allow them to communicate with other Russian navy assets. For Slava replacing the Vulkans with UKSK launcher bins is a bit radical because the Vulkans are obviously external and the UKSK is internal. In the short term moderate upgrades will make both vessel classes more useful than they already are without costing so much that they can't afford other things they need like the smaller ships or the carriers they need the big ships for. In the longer term the obsolete weapons and equipment on the moderately upgraded large ships will become more and more expensive to support, so a more intensive upgrade will be warranted. They will need a new compact and powerful nuclear propulsion system for their new carriers and the Kuznetsov, so by 2020 they will have perfected its design and already put it in the K and tested it, so if it works then putting it in the new carriers as well as the Kirovs and Slavas should make a unified fleet with unified weapons and sensors and propulsion... the benefits of commmonality outweigh the initial costs of doing it. The new destroyers being nuclear powered is....very unlikely IMO. Cost would be prohibitive, admiral was talking out of his rear end. However supposedly the design of the new ocean going destroyer is to be finished soon, so we will know for sure. Putting a nuclear reactor into the 1164s, might as well build new cruiser from scratch . Project 21956 is considered a cruiser class. 21956 is dead for all practical reasons, and Russian navy was never interested in it. What will the new destroyer look like? Maybe scaled up 22350? Or if Garry is right and it ends up being nuclear powered, I imagine the dimensions will be different. It is considered to have the firepower of a cruiser... just the same as an OSA class missile corvette was considered to have the firepower of a WWII battleship with its SS-N-2 anti ship missiles. That doesn't mean the OSA can perform the roles of a WWII battleship, nor does it mean this new destroyer can perform the role of a cruiser. The new reactors will likely last 30 years without refueling, so it might be the case that they are made to be modular so they can be plugged in like a battery. This would mean you could have propulsion pods instead of huge heavy drive shafts and gears. With electric motors and infinite gearing the vessels would become much more manouverable, and more importantly the heavy reactor and all its shielding can be positioned low in the ship near its centre and positioned like ballast. On a normal vessel the propulsion goes at the end of the drive shaft and you need to place ballast around the ship to balance it so that it is stable in the water. As the vessel consumes fuel and ammo the balance shifts so you need to be able to shift a percentage of ballast to maintain the balance. By using the reactor as ballast you greatly reduce the amount of dead weight on the ship and make it lighter, so it displaces less than it would otherwise displace... making it faster. There is no point having nuclear powered carriers zipping around the planet at 35knts+ if the cruisers that are supposed to be protecting it can only manage that speed for 4,000NM before they have to refuel... or in the case of the Kirov class 2,000NM before they run out of fuel and their speed drops down to 16Knts on old nuclear only power. They are building 10 SSBNs and 10 SSNs with nuclear propulsion between now and 2020... they are likely putting another nuke power plant in the Kuznetsov... I think it would be pretty stupid to not put one in the two Kirov and three Slavas they are keeping. And if nuclear reactors are all that expensive... how could developing a new cruiser from scratch with a nuclear reactor be cheaper? Putting one into an existing vessel will not be without risks but it should be much faster? Remember I am suggesting a superficial upgrade and then a later much much deeper upgrade on ships that have largely been kept semi operational. This is not the Gorshkov carrier that sat on a dock for 15 years. If current practises are anything to go by they will try to cram as much as possible into the ship as they can... Frigates look like destroyers, so can we assume destroyers will have the weapons and sensors of cruisers? Wasnt the "ukraina" ukrainian and the russian navy will purchase the ship at 95% completion as their fourth slava class? No, Russia won't be buying it, and it needs much more work than 5% to be completed at this point. Not to mention buying it with current weapons and sensors would be pointless. A Gorshkov class frigate can carry same amount of most modern missiles. Why to buy it then? George1 wrote: A Gorshkov class frigate can carry same amount of most modern missiles. Why to buy it then? In terms of SAMs it defiantly carries less. But is more modern over all ofc. 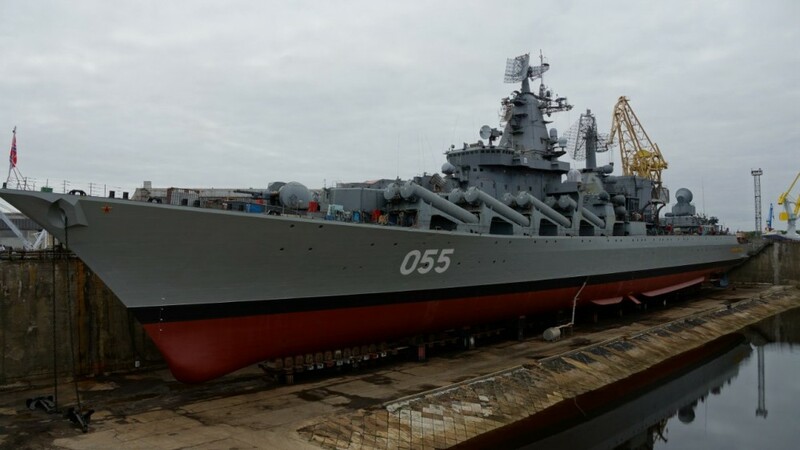 Shipwrights of Zvezdochka Ship Repair Center have placed missile cruiser Marshall Ustinov in the dock for overhaul. It is planned to repair and paint the cruiser's hull, repair propeller-rudder system and bottom fittings. The ship is to be put afloat in May 2013. In accordance with a state contract, missile cruiser Marshall Ustinov must be recommissioned into the Navy by the end of 2013. The state contract for interim overhaul of the cruiser was signed late in 2011. The ship arrived at Zvezdochka shipyard later that year. The cruiser was laid down on Oct 5, 1978 at the 61 Communards Shipyard in Nikolayev under the name of Admiral Flota Lobov. She was launched on Feb 25, 1982 and commissioned on Nov 1986 under the name of Marshall Ustinov. Whats going on with Ustinov. According to this LINK it seems that Ustinov will pass on extensive modernization. Im I wrong? Wonder what work it is getting done. Actually the Slava class are the most awkward as they are moving to a fleet with all UKSK launcher bins for land attack and anti ship cruise missiles, but the Slava has its main missile battery external to the ship, so fitting UKSK tubes means taking up space previously occupied by other things. On the Kirovs removing the SS-N-20 Granits made space for UKSK launchers as both are under deck vertical launch tubes, but with the Slava class removing the missile tubes just clears the deck. The Granits and Vulcans are no longer in production however so room needs to be found for the UKSK and Calibr and Club etc. The Slava reportedly had a lot of electronics systems for the control of a battle group as a potential replacement if the Kirovs were failures, so perhaps a serious thorough upgrade should create an enormous amount of new space for other things and perhaps in combination of a reduced crew size due to the removal of redundant systems and more automation they can make it much more capable than it already is. Latest news report Russia is sending its Slava class cruiser Moscow? to mediterranean sea near Syria. and there are 4x Arleigh Burke-class destroyer not far . before they reach Syria. then question is..
1)How many tomahawks missiles each US destroyer can launch? other defense systems in the slava in total? Syria Is not the reason they sended ships to the mediterranean. But if all the arleigh burkes fire missiles at syria, is 4x 96 missiles is much much too much for the slava to intercept them but probably the us wont fire them all so the slava will be able to intercept alot of them. But as i was saying before they are not sending them for the conflict in syria. so 96 tomahawks per destroyer. that answer my first question..
2)second question is how many tomahawks a Slava class like moscow can intercept with its S-300s? 3)and how many with other defense systems the slave class have?